In a time when brick and mortar retailers are seeking new ways to attract new customers, and create loyalty among existing shoppers, the concept of a Marketplace has emerged as an ideal way to optimize a business’s cross-channel strategy. Even the retail team at Amazon was concerned when its new Marketplace concept was initially launched. But this launch was part of Amazon’s core DNA, as the company fearlessly and continually takes risks to adapt to customers’ expectations. “Our focus has always been on providing services that help customers find the right product for them, and then ensuring that ordering and delivery is a fast and seamless process”, says Xavier Garambois, Vice President of EU Retail at Amazon. Today, Amazon’s Marketplace is an enormous part of its success. In 2016, Amazon’s Marketplace merchants accounted for more than half of all units sold. You might be thinking, “but, Amazon is primarily an online business.” What about retailers with a brick and mortar presence? Even brick and mortar companies benefit from a Marketplace as offline is integrated into online, and physical offerings can be scaled through additional channels. How can this hybrid approach improve both offline and online retail? A larger product catalog is a surefire way to delight customers. Brick and mortar retailers can rely on the operational excellence of third party sellers to expand their selection, without having to deal with storage or logistics. A marketplace product is always profitable: regardless of its price or sales volume, you will still receive a fixed commission equivalent to the net margin. What’s more, a Marketplace can allow a retailer to test new products and brands at no risk. What sells best on your Marketplace could then be sourced directly by your own buying team, and integrated into your product mix. Note: The ideal Click & Collect option is to allow the same shipping fees as Retail products and products returns in stores as well. Harvey Nichols for example, has negotiated with all sellers to apply the same shipping fees on Marketplace and Retail products, but also allows product returns in stores, for free. Imagine a world where your stores had 100% availability on every product channel. It’s possible with an “endless aisle” powered by a Marketplace. Many retailers with a large network of physical stores allow customers to access to their entire online and offline catalog wherever they are, even in stores. They equip salespeople with tablets to assist customers and provide access to additional products available online. The retailer’s salespeople can help to guide the customer and order products in stores directly with them if customers find what they are looking for online, decreasing the chances of a customer leaving the physical store due to unavailability issues. Multi-channel consumers spend 2X as much as offline consumers, and 3X more than a customer purchasing products only online. Retailers who take advantage of multi-channel shopping behaviors will stand to reap the benefits. According to a Forrester study, 90% of consumers said they were satisfied with their purchase from a marketplace. 90% also said that they would shop with the same marketplace again when purchasing a similar product. Consider the value of overstock, return, or damaged items today, sitting in your brick and mortar warehouse. A Marketplace could allow you to sell these items through physical stores as second-hand products on your marketplace. This increases store revenues without the normal e-commerce costs. A brick and mortar brand experience is comprised of the journey a shopper has both in-store and online. Too often, these two channels operate in a completely disconnected fashion. When combined together under a cohesive and holistic endeavor, a Marketplace and brick and mortar retail strategy presents a massive opportunity for organizations. Are you willing to invest in a successful cross-channel customer experience? 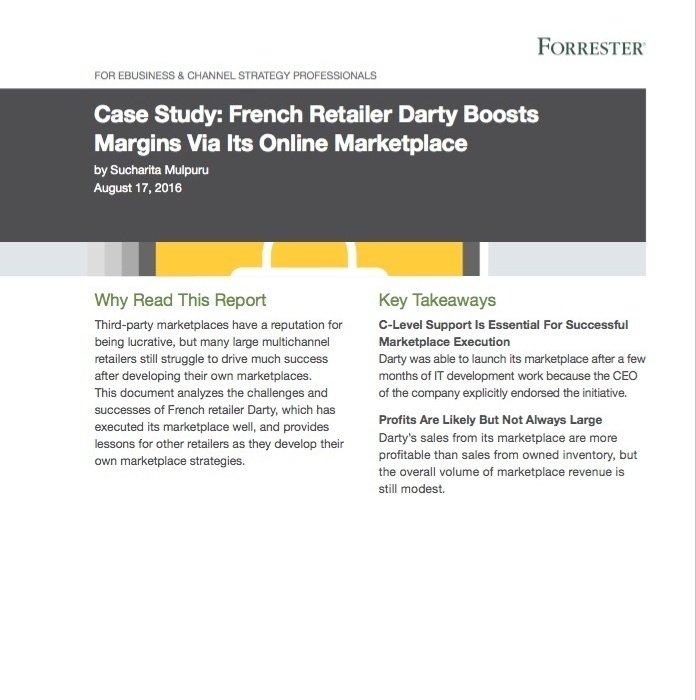 Read why Forrester believes retailers must seize the Marketplace opportunity.